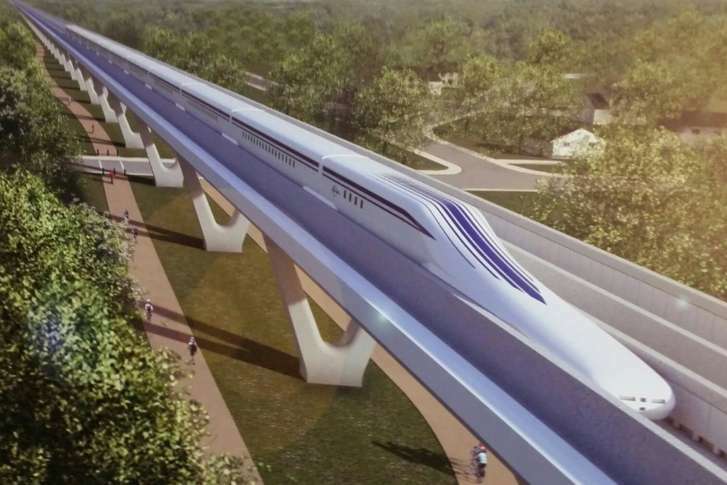 With many residents worried about the impacts of a potential $10 billion high-speed maglev train that would connect D.C. and Baltimore in just 15 minutes, members of the Prince George’s County Council questioned the benefits of the project Tuesday. WASHINGTON — With many residents worried about the impacts of a potential $10 billion high-speed maglev train that would connect D.C. and Baltimore in just 15 minutes, members of the Prince George’s County Council questioned the benefits of the project Tuesday, even as project leaders suggested they are now focused on a path that they say would mean fewer disruptions. “Citizen opposition is very high, and, matter of fact, information seems to be very low,” Council Chair Derrick Leon Davis told representatives of the private groups that would build and run the line. Kisha Brown, community and external affairs director for Baltimore Washington Rapid Rail, said the group is now leaning toward one of the two routes (click for an interactive map) that tunnel from downtown Washington under Bladensburg and Greenbelt before emerging above ground on one side or the other of the Baltimore-Washington Parkway to near Fort Meade, where the train would go back underground to a station at BWI Marshall Airport, then under the Patapsco River to Baltimore. She agreed more information needs to get out to the communities that could be tunneled under, or be near power stations or a rail yard. The State of Maryland supports the project, and is running the environmental impact statement process that could lead to approvals for construction within two years. The study is funded through a $27.8 million federal grant. “This has been a very fast train,” Davis said of the process. The County Council does not have to vote to approve the project, but asked for additional information due to the significant public interest in the project. “$10 billion can go a long way and I think all of us could find some really great ways that would serve many more people than an elite maglev line would serve at Acela price rates,” Councilmember Danielle Glaros said. Maglev trains float on a magnetic cushion above the track, reducing friction and allowing higher speeds. Project director David Henley said a related effort more than a decade ago failed because the tracks would have crossed roadways or run alongside Amtrak service. “The mistake was doing it at-grade, which was extremely disruptive on the surface, so was very unpopular,” Henley said. The current idea is to completely separate these tracks so the train has more opportunity to reach top speeds around 300 mph. “You have your own alignment. It’s independent, doesn’t have any shared [track], and — by the way — it’s underground or it’s above ground. It’s not at grade, so it’s less disruptive,” he said. Councilmember Mary Lehman challenged that idea. “The notion that because 60 or 65 percent of this proposed line would be underground that there would be not much in the way of community impact it’s really — it’s offensive,” she said. Eventually, the project’s supporters hope to extend the line to New York to make for a one hour trip between Manhattan and the District. Funding for the initial $10 billion stretch between D.C. and Baltimore would largely come through low-interest loans from the federal government and Japan, where the technology was developed. “It just seems unthinkable … that suddenly this high-speed train system coming out of nowhere would be everyone’s top priority,” Lehman said. Several council members wondered why that $10 billion would be spent on maglev, when existing roads, bridges, the Metro system and Amtrak do not even have the money they need. “While I know the federal government can print money, the fact is that we need them first and foremost to step up in supporting our Metro system,” Councilmember Todd Turner said. “Spending one public dime on this project would be a big mistake,” Councilmember Mel Franklin said. “Most of what I hear is that it’s all burden and no benefit to Prince George’s County. It’s hard to come up with what’s in it for Prince George’s County. … We get a lot of impact from potential loss of homes if that happens or potential paths going through communities … but no sort of upside,” Franklin said. Northeast Maglev did get authority to use eminent domain to take properties for the project, when the Maryland Public Service Commission approved the group’s takeover of an old railroad franchise. “That becomes an issue which is a lightning rod, which is something that we’re not interested in using. That’s something that comes with a franchise; that doesn’t mean we will use it,” Henley said. Public meetings on the project are ongoing, and more meetings are expected next year as part of the environmental review process. Residents worried about the line have already expressed concerns about losing homes, noise and vibrations, while supporters of the line have salivated at a potentially quicker trip past the region’s notorious traffic. “It reminds me frankly of the Concorde airplane, that has come and has gone,” Glaros said.